including individual special feature pages on: Swashbucklers, Gerry Anderson Productions; U.F.O. ; The Man From U.N.C.L.E. ; Star Trek; Carry On TV; Doctor Who; Robinson Crusoe and Batman. 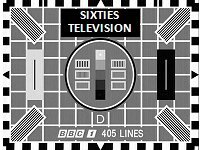 including individual special feature pages on: The Eurovision Song Contest; Juke Box Jury; Royal Command Performances; Top Of The Pops; Thank Your Lucky Stars and Ready Steady Go! His may just possibly not be one of the first names that immediately spring to mind when reminiscing about the Sixties, but there is no doubt that he was instrumental, and right where the action was, behind some of the most iconic shows on British television in the Sixties! Neville has been kind enough to share a few of his many memories and anecdotes with Sixties City, increasing our wealth of information about the remarkable personalities and achievements of that decade. international TV light entertainment contest.